Raine finally knows that her gorgeous neighbor, Torin St. James, is a legend straight out of Norse mythology, and that her feelings for him are strong. Torin is crazy about Raine too, breaking the one rule he lives by: Never fall for a mortal. The problem is he no longer remembers her, his memories erased by Norns—Norse destiny deities—to punish her for defying them. Ednah Walters definitely exceeded my expectations with this second book. Immortals was everything I was looking for in the first book. We got to learn more about the background and what being an immortal actually entails, I got much more of Eirik and Torin, and so much action to punch that I couldn't put the book down! It's definitely hard to review a second book in a series without spoiling anything, but I always try my best to stay short, simple, and to the point. With Immortals, I really liked the few new characters we got to meet and yet I loved seeing all the old ones as well. Watching Raine come into her powers and learn runes was awesome as well, I totes wish I could do that! I adored my boys Andris, Eirk, and Torin in Immortals as well. I know in the first book I was wishy-washy, but with this one I have a clear view of my thoughts on them and that made me extremely happy. The funny thing with this second installment, is that I expected the "who" to be behind all the trouble-making... but I never expected the "how" (you'll understand what I mean when I read it). I was really surprised by the ending and it was a fantastic surprise. I also in this book got the type of ending I wanted - one part bittersweet and three parts heart-melting. 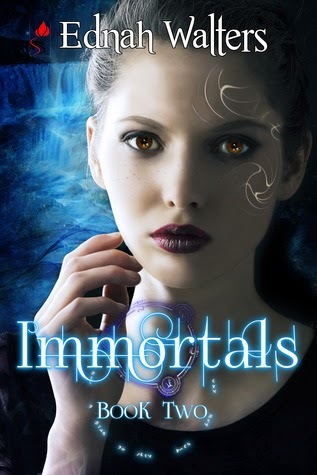 Overall, Immortals was all-around a complete win for me and I now will be anxiously awaiting book three and hoping that Ednah won't break my heart. Ps. I just adore these covers! I think they're just so darn lovely.